Welcome to Moscow March for Jesus! Be a part of Global Project 2001 - June 2, 2001. Below is the brief history of Moscow Marches for Jesus. 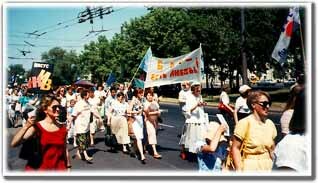 1992 This year was the begining of Moscow Marches. Our church - Moscow Charismatic "Dew" ("ROSA") Church was able to come to the streets of Moscow. We invited Moscow Christian Center and some Korean churches also. All together it was about 800. The rout was by Garden Ring, final point - Gorkij-park. 1993 The 2-nd March. We had the same root. It was over 1000 peolpe with representatives from several other churches. We didn't have official permision yet. 1994 The 3-d March. We've got official permision from the city council. It was over 2000 christians form different confessions and several missions like: "Mission Possible", "Jews for Jesus", "Calvary International" and so on. The final point was on Boulevard Ring near TASS-building. 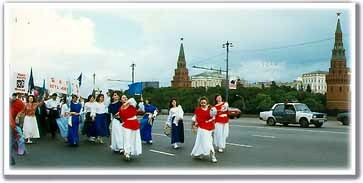 1995 March for Jesus has become well spred in several cityes of Russia. S-Petersburg - 10000; Vladivostok - about 1000; Moscow - 4000. We got a new root from Arbat-street, passing by new Cathedral of Christ the Savior, by Moscow-river bank, the final point was Gorky-park. 1996 1996 was a special year because it was the year of the election of the Russian President. This year the March was joined by the representatives of the Baptist churches, 7th Day Adventists, Salvation Army, Christian Democratic Union and Christian Social Movement. Altogether about 5,000 people participated in the March. In the day of the March there was heavy rain, thunder storm, and even hailstorm throughout Moscow. But the Lord gave His people a sign: during the March there was a window of clear blue sky over the colomn of marching people! One KGB general, who was at the March for Jesus that day, said: "I feel so much joy and power in this place. It was worth living to see this day." 1997 In the last year of 1997 the March has joined together 50 Moscow churches, congregations, missions, and other Christian organizations from different regions of Russia. In the March participated representatives of Calvary Chapel, Word of Life Church, Rosa Church, Moscow Christian Center, independent Pentecostal churches, Baptist churches, Pentcostal Union and many others – about 7,000 people. Besides Moscow, there were represented Christian churches of Vladimir, Podolsk, Tver, Kazan, Usman and other cities of Russia. 1998 This year's March for Jesus '98 in Moscow had about 10,000 participants from different Christian denominations, churches, missions and organizations, including Baptists, Pentecostals, Charismatics, Catholics, Messianics, Presbyterians, and Russian Orthodox Christians. The route of the March went through Moscow downtown areato Gorky Park, where the closing meeting was held. During it the pastors of Moscow churches prayed for all believers in Jesus who are being persecuted in the different parts of the world. Among the participants were representatives of Rosa Church, Moscow Christian Center, Word of Life, Jews for Jesus, Mission Possible, Russian Charismatic Association, Calvary, Salvation Army, Christian Democratic Union and many others. 1999 Report from Russia, from Rosa Church Office People from 18 cities joined the March for Jesus in Moscow. Some had travelled over 1000 km to be there. The previous week had been cool and the organisers' prayers were answered when the day dawned warm and bright. The police and authorities proved very helpful and willing to protect the march, which is unusual. The new route went close to Red Square behind St Basil's church. On the Moskvoretskiy Bridge the marchers prayed for the Kremlin. They whole march lasted and hour, and finished with prayer and praise for over two hours. Over 5000 people from a range of churches including charismatic, Presbyterian, Baptist, Salvation Army and Pentecostals joined in, They prayed for the unity of the churches and for the political and economic situation in Russia. Those who had travelled a long way came from small towns where the authorities had not allowed them to have marches. For instance, while Smolensk, Vladimir and Samara were able to march, the large city of Rostov was refused. The celebration ended with strong support from the leading police officer, "I would be happy to march with this kind of procession every day, Your musicians and music are wonderful." See more at the Global March for Jesus web-site.